Now, I studied geography in college. I’m used to being incessantly asked what are, by now, tedious questions: What is geography? Is that, like, making maps? What do you do with a geography degree? Apparently, you go work in a startup. Still, these queries never felt so utterly personal as people’s reactions to my Detroit news did. It’s as if Detroit’s current state–in shambles, to say the least–and my decision to move there, was a reflection of my own moral fiber. The prevailing sentiment being that Detroit was Bad, and that I was somewhat insane for moving there of my own volition. So I found myself a staunch defender of a place I haven’t even moved to yet, that I saw for the first time during my job interview. And, moreover, that I was leaving the place I’m crazy about–Chicago–to relocate to. I spent the last few years telling people I totally planned to stay in Chicago after college, and I didn’t even manage that. Honestly, though? I’m thrilled to be in Detroit. As I constantly insist to concerned family and friends–while fully recognizing the city’s manifold problems–there’s exciting stuff happening there! The New York Times has an article about it, like, every week. And not to push the “city is a startup” analogy I’ve seen elsewhere (I have some serious issues with the comparison), but where others see a city taking its last gasping breaths, I see opportunity for revival. [Hopefully, an inclusive revival that takes steps to ameliorate the segregation and income inequality that’s plagued the city for decades]. I know enough about cities to trust in their capacity for change. Yeah, parts of Detroit look really bad, but so did wide swaths of Chicago not too long ago, and now it’s a Midwestern success story, problems notwithstanding. I guess it’s typical of me to spend all of this first blog post talking about place. That’s how I know to talk about myself. I’m a geographer through-and-through. An early draft of the mission statement for Anthology of Chicago, the literary project I started, says, “As much as we shape our neighborhoods, our neighborhoods shape us.” And I’ve been thoroughly shaped by place, especially these last four years in Chicago. I’m looking forward to seeing how Detroit changes me, too, and maybe even how I can (play the tiniest part in helping) change Detroit. I’m spending at least the next 2 years there with Detroit Labs as a Venture for America Fellow. VFA is a program that places recent graduates at startups in high-need cities, giving those fellows entrepreneurial experience and helping to revitalize those cities. 68 Fellows from this year’s class are going to places like Detroit, New Orleans, and Cincinnati, with the goal that we eventually start businesses in those communities. The NYT recently covered Detroit Labs, discussing the company’s partnership with local automakers–who employ Detroiters–to build in-vehicle apps. Detroit Labs has a strong emphasis on culture and some fierce Detroit pride to boot. 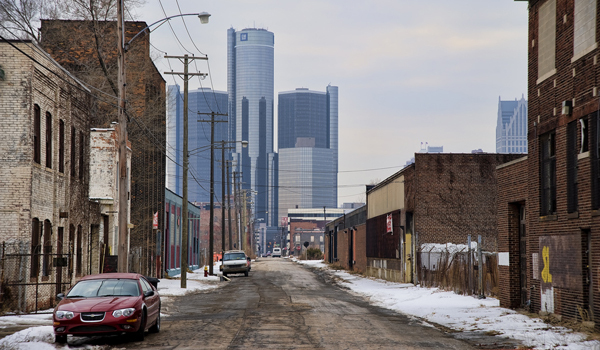 That’s why I’m excited to move to a city that I’ll fully admit is struggling, is no Chicago–to play a part, whatever it may be, in rebuilding Detroit into a thriving urban area. I’m optimistic, but aware of the challenges ahead. It’s gonna be a hell of a ride, and I’m looking forward to blogging about it–startups, urban things, and all the rest–on here.